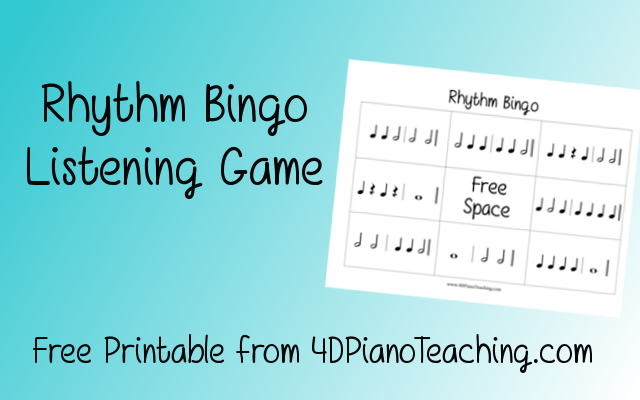 I was inspired by some of the rhythm ideas in Christopher Fisher’s book Teaching Piano in Groups (read more about this book here and here) to create a rhythm bingo game for use in my group piano classes. This game can be used in any beginning group piano classes. The rhythms are simple, using only quarter notes, half notes, whole notes, and quarter rests. The purpose of this game is to improve students’ rhythmic aural listening skills. I made 6 different bingo cards so you can play with up to 6 students. It will probably work best with 4-6 student, but could still be used with 2 or 3 students in a smaller class. This works just like a simple bingo game, but instead of calling out letters the teacher claps a rhythm for the students to find on their bingo card. I would suggest laminating all of the pages and then cutting out the bingo draw cards . You can download the PDF file of the game below, including instructions, enjoy! Halloween Music - Free Duet!